This Amana brand TwoStage, Variable-Speed Furnace offers 96% AFUE, as opposed to lower ratings of less efficient gas furnaces. Its variablespeed blower can improve its efficiency rating and enable the furnace to maintain consistent warmth in low-heat capacity mode without inefficient high-heat surges associated with singlespeed gas furnaces.Often you have no choice but to replace your old, worn-out furnace; however, you can choose to go with a name you know, like the Amana brand, one of America's most trusted and enduring consumer brands. Yet, peace of mind isn’t all that you’ll enjoy with an Amana brand AMVC96 Two-Stage, Variable-Speed Furnace.Many homeowners may think the best gas furnaces are not seen or heard. That’s why an Amana brand AMVC96 Variable-Speed Furnace strives to operate on low capacity as often and as long as possible providing quiet and highly-efficient performance compared to units containing a single speed motor. Energy efficiency equates to cost savings. A gas furnace’s efficiency rating can primarily be determined by two factors: its AFUE rating (Annual Fuel Utilization Efficiency), which indicates what percentage of each dollar of natural gas purchased is actually used to heat your home; and the type of blower used in the furnace.ComfortNet™ Compatible – Continuously monitors system performance and allows remote control of system as an option. LStainless-Steel Tubular Primary Heat Exchanger – Unique tubular stainless-steel construction formed using wrinklebend technology results in an extremely durable heat exchanger. Paired with a stainless-steel secondary heat exchanger, this combination provides reliability, durability and efficiency. LEfficient and Quiet Variable-Speed Circulator Motor – Provides quiet system startup and shutdown with highly efficient performance. LDurable Silicon Nitride Igniter – Eliminates the need for an energy-wasting pilot light. LTwo-Stage Gas Valve – Reduces energy needed during moderate demand to deliver outstanding comfort and efficiency as compared to single-stage gas valves. LQuiet, Two-Stage, Induced-Draft Blower – Provides precise control and enhanced energy-efficient performance as compared to a natural draft furnace. LContinuous Air Circulation – Provides added filtration and keeps air moving throughout your home to help maintain comfort. LSelf-Diagnostic Control Board – Continuously monitors the system for consistent, reliable operation, stores last diagnostic codes in memory and indicates condition through a dual 7-segment display for quick troubleshooting. 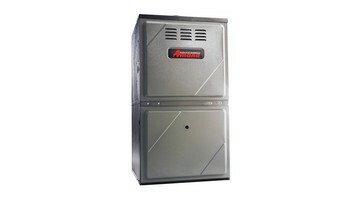 LHeavy-Gauge Steel Cabinet with Durable Finish – Resists corrosion and protects essential components.Thermally Insulated Cabinet – The fully-insulated cabinet means air leakage of less than 2% to maximize heat transfer efficiency and lower blower noise.To truly seal the deal, Amana brand gas furnaces are backed by industryleading limited warranties. The majority of our gas furnaces are backed by a Lifetime Unit Replacement Limited Warranty, while all Amana brand products feature a 10-Year Parts Limited WarrantyThe most critical component of a furnace is its heat exchanger. The Amana brand heat exchanger is built to deliver durability and performance. Along with our Sure Start Ignition System and its silicon nitride igniter, Amana brand furnaces’ key components continue to set our standards for reliability.When you receive an AFUE rating of 90% or more, your gas furnace is performing at the top of its class. Simply put, the Amana brand AMVC96’s 96% AFUE rating means 96¢ of every dollar you spend on energy is actually used to heat your home. That’s very little wasted energy when compared with lowerrated or older, increasingly inefficient heating systems.